The Armenian lion is back where he belongs: in the 2800's club. Levon defeated Kramnik today, taking down number one and number two of the FIDE rating list in two straight games with White. Aronian is playing powerful chess, like in the days where only a stellar Magnus stopped him from climbing to the very top of the FIDE list. 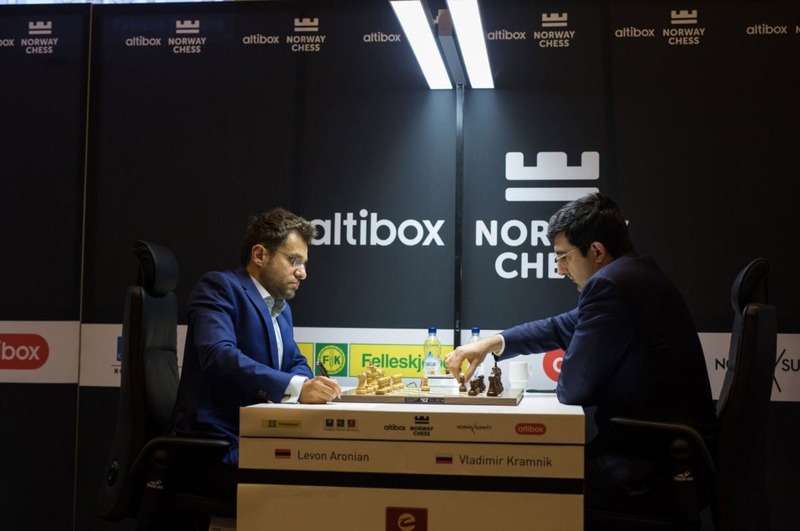 After winning the Grenke Chess tournament convincingly, now Levon joins Hikaru Nakamura as the leader of the Norway Chess, arguably the strongest tournament of the year. Aronian's wins shook the live rating list, mixing up the super-GMs positions. And speaking of felines, the Tiger of Madras today got back to victory, beating an uninspired Fabiano Caruana. Fabi accepted rather passively Anand's initiative, and the Indian proceeded to strangle the American slowly but steadily until Caruana blundered badly - in a lost position, is to be said - and got caught in an inevitable mate net. Here is IM Sielecki's video recap.